3 X GRAY COLOR CHAMPION! 2016 AFD: 23.7 SD: 4.5 CV: 18.8 Actively Breeding & 10 Years Old! POLARIS is a MULTI-TIME WHITE COLOR CHAMPION, the last being presented to him by Mike Safley, when Polaris was almost 4 years old! POLARIS is a PRODUCER OF CHAMPIONS: SLEEPING MONK FARM ARLO was his first and THE MONK'S OLIVER is his second. POLARIS is a very reliable producer of exceptional offspring. CPERUVIAN OPALIUM (OPS) is now deceased. 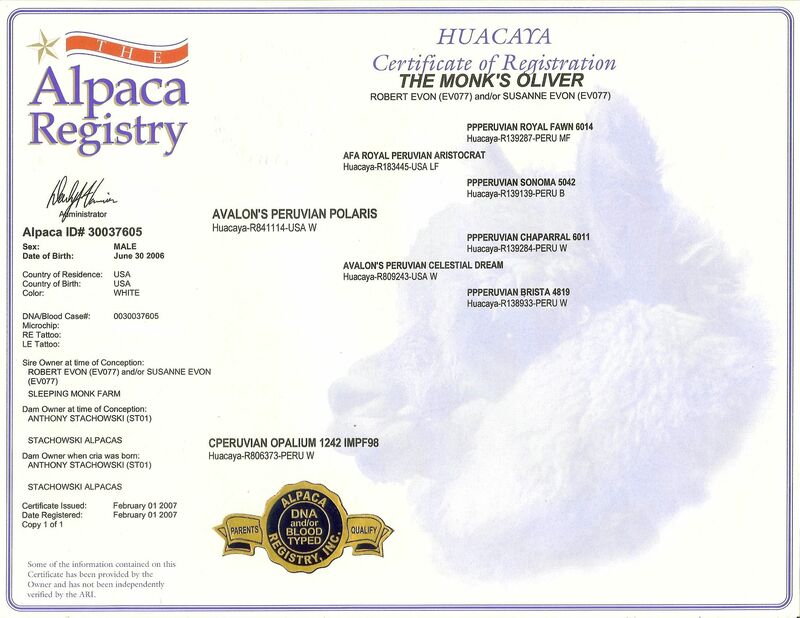 She was one of the highest quality alpacas we have ever owned and produced exceptional offspring with POLARIS. In 2007, at the age of 11, she had a MC of 22! We wish she had been with us longer, but she has gone to Higher Ground and is at peace. OLIVER is in the TOP 5% OF EPDs for AFD, SDAFD, SF, %F>30 and MC! We are looking for the right-fit farm to partner with OLIVER with us...is that you? If so, contact us so we can talk! 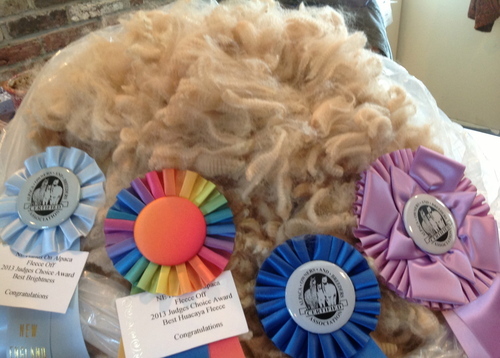 FROM THE 2013 NORTH EAST ALPACA EXPO: An OLIVER SON, GMF Lester, was the Light Reserve Color Champion, at 42 months of age! Can you say lingering fineness? 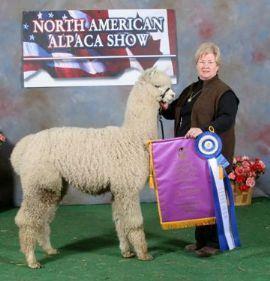 OLIVER adds 2 more sons to his list of CHAMPION OFFSPRING at the 2012 Big-E Alpaca Show under Judge Wade Gease! OLIVER adds SLEEPING MONK FARM OLIVER'S AUGGIE to his list of champions sired at the 2015 NAAS! Call us to reserve your breeding(s) to OLIVER. Let him sire a champion for you! $500 deposit with signed contract and a schedule of balance payments that work for you! LIMITED OUTSIDE BREEDINGS AVAILABLE!!! 7 X CHAMPION OVER THE BEST FROM MANY WELL KNOWN FARMS AND NOW THE SIRE OF CHAMPIONS AS WELL! OLIVER IS HOT!!! 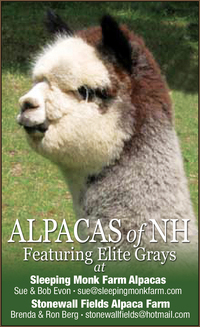 HE HAS HAD A SPECTACULAR IMPACT IN THE SHOW RING & NOW HE IS PRODUCING ELITE WHITE & COLORED CRIA AS WELL! OLIVER, a 7 X Champion, has already produced 3 CHAMPIONS for our customers! This is what we call IMPACT GENETICS! OLIVER WON HIS 7TH CHAMPIONSHIP PLUS JUDGE'S CHOICE AT 2009 GREEN MTN ALPACA SPECTACULAR NOVEMBER 1, 2009 AT OVER 3 YEARS OF AGE!!! 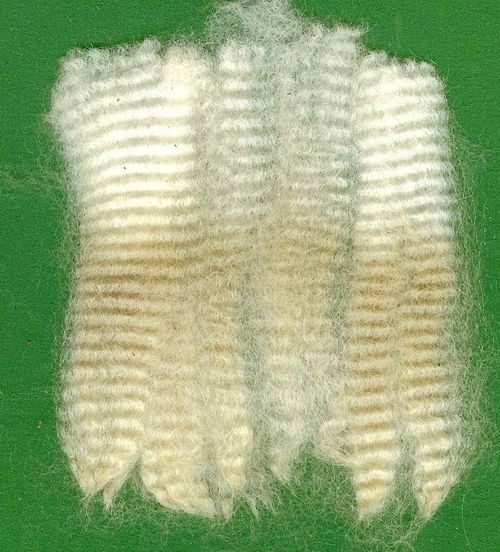 JUDGE: CHERYL GEHLY ~ COMMENTS: "Well, my oh my! What a beauty in every way! (Is cloning an option?!!!)" OLIVER IS TRULY AN IMPACT HERDSIRE! A long time, knowledgeable breeder recently told me: " I have never seen one male consistently able to improve ANY female (even below average) as much as Oliver. I have seen nice males make measured improvement but there is a huge leap in development in the Oliver cria over their mothers. OLIVER has produced cria of all colors with the exception of True Black. I'm sure that will happen some time soon as well. 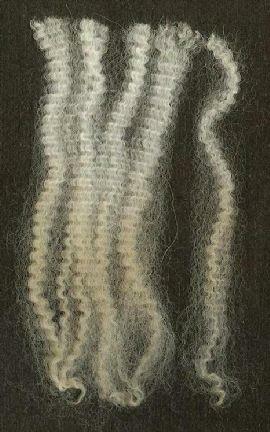 All of the Oliver cria have fleece characteristics resembling their sire. The fleece development and organization of character spreads further into the belly area, all the way under the belly, way down the legs & goes further into the brisket area, than is norm in the industry today. Oliver's cria are amazing & are easily picked out with just a quick glance in amongst a group of cria." All of the cria have very bright, well bundled fleeces on very correctly conformed bodies. We love what OLIVER is producing! OLIVER IS EXCEPTIONAL & SO ARE HIS CRIA!! White Color Champion - April 2007 - NAAS - A. VandenBosch. Over 123 other white males. AOBA record! WE WORK WITH YOU TO DESIGN FINANCING TERMS THAT WILL WORK FOR YOU, INCLUDING THE DOWN PAYMENT AND THE MONTHLY PAYMENT. 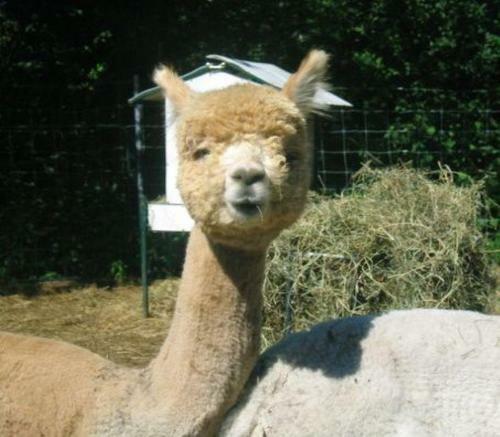 WE WANT YOU TO ENJOY YOUR ALPACAS, NOT FEEL BURDENED DOWN BY YOUR PURCHASE. 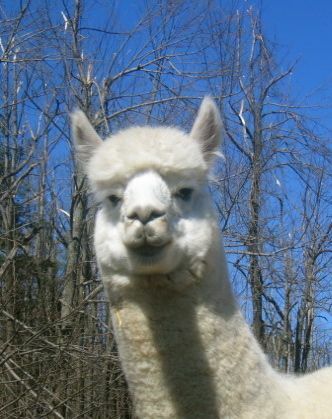 GIVE US A CALL TO DISCUSS ANY ALPACA(S) YOU ARE INTERESTED IN.